Honey’s Sit ‘n Eat is a very popular spot in Philly that just opened up a new location two blocks away from my apartment. 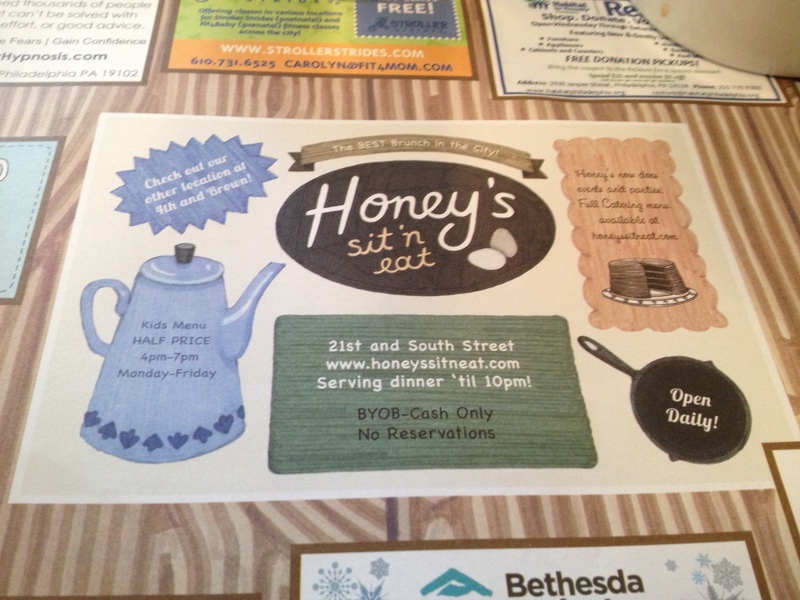 Honey’s is not only famous for their delicious brunch menu, but for their LONG wait. The menu is a mix of classic Comfort & Jewish food creating some seriously tough decisions when ordering. Alright… I’ll admit, this place is absolutely worth the hype. Isn’t that so annoying?! I’ve been trash talking the new Honey’s on South & 21st since opening weekend. Really… I was just jealous walking by the CONSTANTLY packed restaurant having never been there. Every single time I tried to go for brunch, the wait was at least an hour and a half, which is completely not do-able for this girl… since I’m starving about ten minutes after I wake up. Easter morning seemed like an appropriate time to try it out, and I was right. We were seated immediately (mind you, it was still only about 10:30)! Atmosphere: The restaurant is great, I love the decor, love the chalkboard displaying the specials, and the windows on south and 21st provide so much natural light… it was just gorgeous on a sunny Sunday morning. 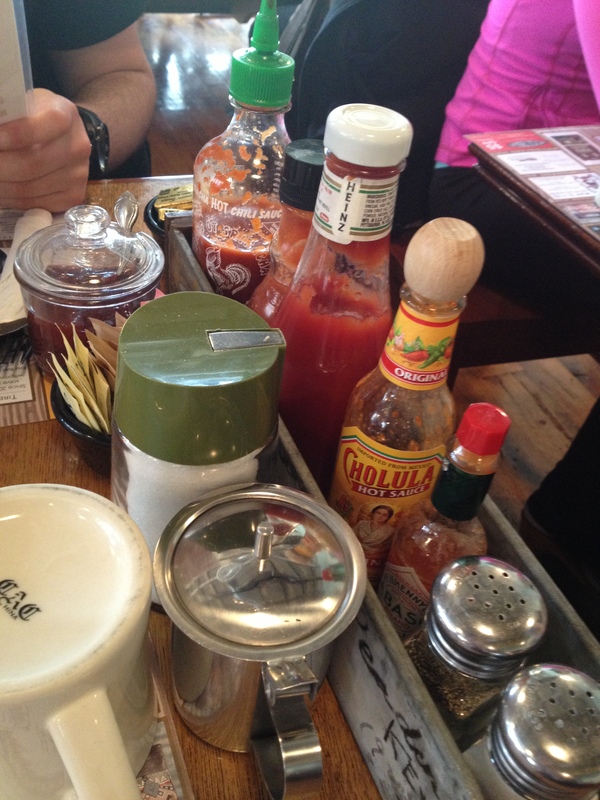 There’s also four types of hot sauces and other condiments on the table so I was pretty much in love at first sight. Look at all the condiments!! We were in heaven. Service: Constant refill of water and coffee is typically how I judge service for brunch, and Honey’s had this down to a science! Our server was also very sweet and friendly. Food: De-freakin-lish. SO GOOD! I decided to get an omelet rather than one of the specialties (which ill get next time) because I wanted to try the sides- Home Fries & Biscuit. Boyfriend did the same but got the Latke. Sides were so good. Home Fries and Latke were both great but you HAVE to get a Biscuit and slather it with the softened butter on the table and strawberry preserves. YUM! 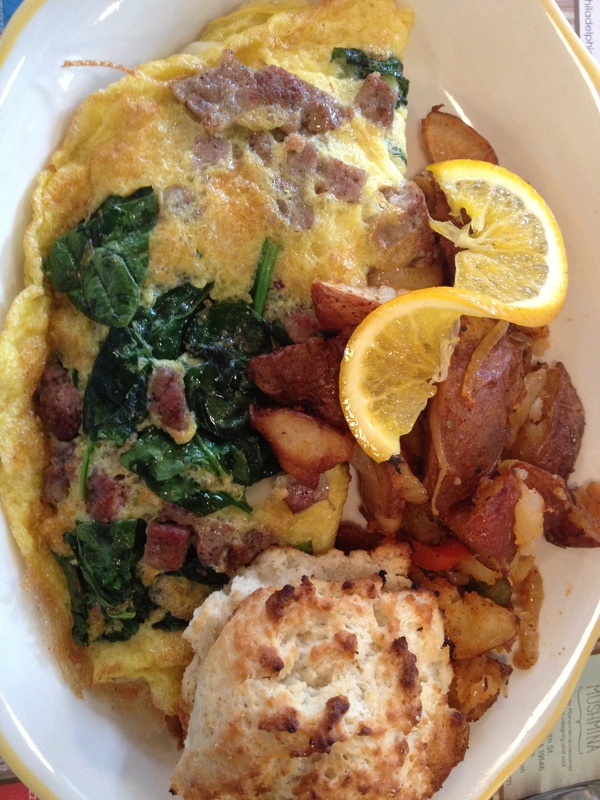 I got a Spinach, American Cheese, and Sausage Omelet which I’d say is the best I’ve had. Cooked perfectly and the type with the toppings mixed in (my fav) and the Sausage was a great choice- it caught my attention because it is homemade and I was very impressed. One of the best Omelets out there, I love when the toppings are mixed in and not just in the middle of the cooked egg. Mine had Spinach, Sausage, and Cheese. 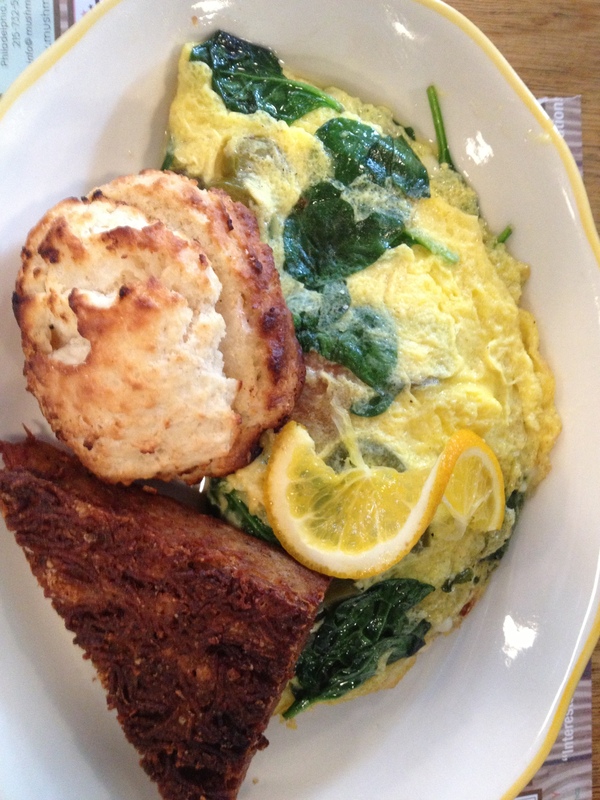 Dave’s Omelet: Spinach, Chorizo, and Cheese. YUM! He also ordered the Latke as a side which was perfectly crispy on the outside and creamy in the middle. 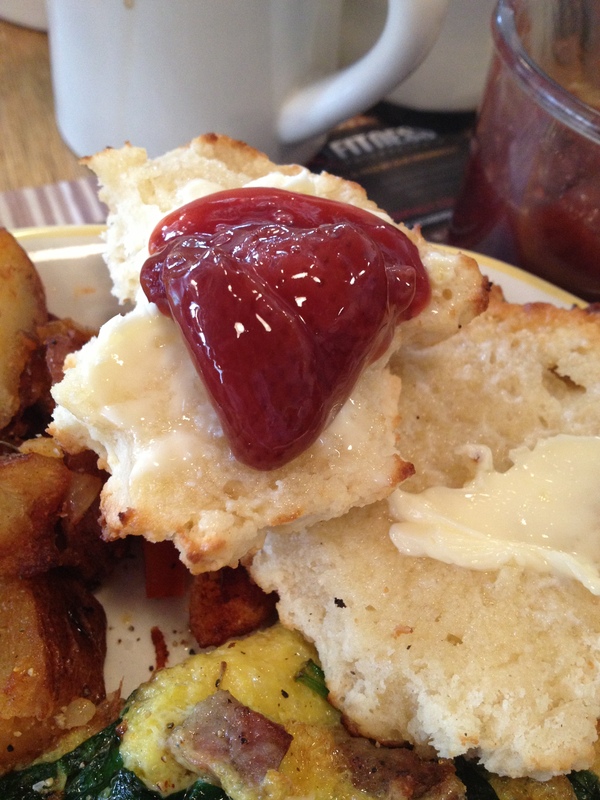 The Biscuits were so tasty with the fresh strawberry preserves on the table. Overall, Honey’s is going to be a favorite of mine for a while, I think. If you are dying to try it, like I was… I highly recommend sucking it up and waking up early to go so you don’t have to wait. Wonder where else we’ve done brunch so far? Check it out!